While pondering some of things I want to do next season, my thoughts turned to some offshore sailing crossing larger bodies of water. Ian & I have been contemplating sailing in the Wash. Aware that winds at sea can be much stronger than inland ponds & lakes coupled the fact that I don't have outriggers or a reefable rig, I started thinking about carrying a storm sail or mini storm rig. I already have the mast and if I knocked up (Got my wifey to do some sewing) a small sail that simply had a pocket down one side to slide down the mast with a small 3 foot boom, (Already sewn in) I could have a 6 sqr foot storm sail should the winds really pick up. It might even be quicker to put up than to reef in the high spec Expedtion 35 and take no space on the canoe. Photo below of what I am considering! The storm sail would effecively be an emergency sail to get you home! Anyone see why something like this wouldn't work? Seems like a workable idea. This would be a bermudan sail so you could also think about making it as large as your mast length permits and then have the option of reefing / reduced sail, down to a scrap if necessary, by rolling round the mast. But is it worth spending time and money to get round not having an easily reefable mainsail or amas? You could just bite the bullet and go for a bermudan rig which would give you options of everything from 44 sq ft (or 54 sq ft is another common size) down to a handkerchief. I've sailed with my bermudan reefed down to the sort of area in your illustration. Alternatively (or as well), amas would add a wide margin of extra safety for sea sailing. There again, experimentation with a new idea like yours has it's own interest. I've also been thinking about a storm sail - for three possible scenarios; a broken mast, badly ripped mainsail or being caught out in a gale (force 8 upwards) when it might be necessary to be able to carry on making way but with the mast laid on the deck to reduce windage and rolling. I have wondered if I could use the boom as an improvised mast with a small loose footed sail. However, I suppose in the latter case the boom might break. Last edited by GavinM; 20th-December-2011 at 05:05 AM. This would be a bermudan sail so you could also think about making it as large as your mast length permits and then have the option of reefing / reduced sail, down to a scrap if necessary, by rolling round the mast. Difficult to achieve. If you simply roll a sock type sail around the mast, what stops it from unrolling when the wind pushes against the material? You could just bite the bullet and go for a bermudan rig which would give you options of everything from 44 sq ft (or 54 sq ft is another common size) down to a handkerchief. Yes, but I like the idea of a compact Expedition rig that fits in the boot when traveling, or in the canoe when paddling. Also, as you say, there can be a fair amount of rolling with a tall mast, something you don't really get with the Expedition rig. As you say, the idea is to get you out of trouble in really big winds. The sort of winds where even a 20 square foot sail area is too big or the normal main sail is damaged. 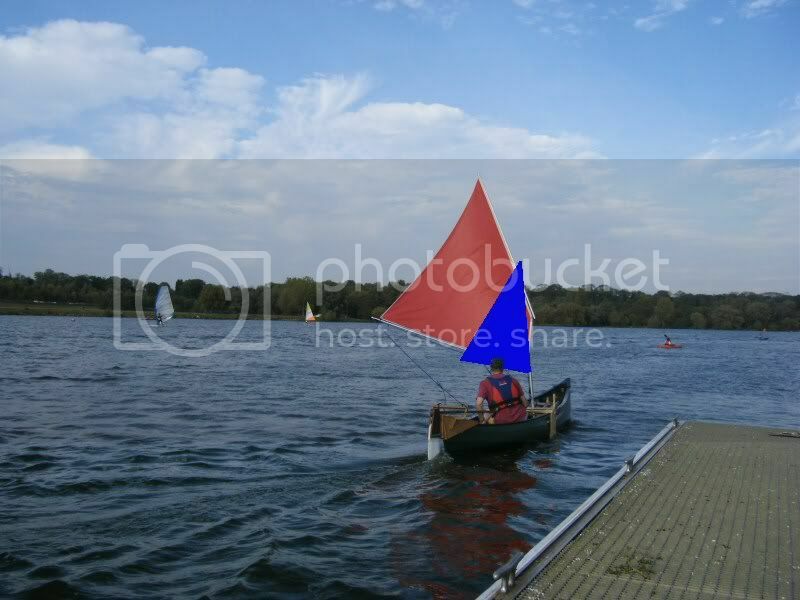 In October, a gust hit me while at Ferry Meadows and snapped the wite cord that ties the sail to the top spa and my sail started flapping loose! Luckily I was a 2-minute paddle from the shore so was able to sort it out, but had I been at sea with winds picking up, I could have found the situation more challenging. I quite like the idea of having a little bag (About 3 foot long) stowed on top of my aft airbag and inside is a mini boom complete with storm sail rapped around it and a block swinging on the end, ready to feed my sheet through. The cost of knocking something like this up would be less than £20. I have experimented sailing with a heavily reefed bermudan sail in winds as strong as force 6 gusting 7 and it is still possible to sail upwind. The smallest sail size was probably about 10 to 15sq ft. I think if you went any smaller than this there may not be enough drive to overcome the windage of you and the canoe and you would not be able to make any progress upwind. This playing around in very strong winds was on inland lakes where if i got it wrong i could sail off to the side and land. I would be reluctant to suggest that this heavily reefed sailing in exposed coastal waters was a sensible option, especially in an open canoe. The large waves that can quickly build up on large bodies of water will make sailing upwind even more difficult or even impossible. 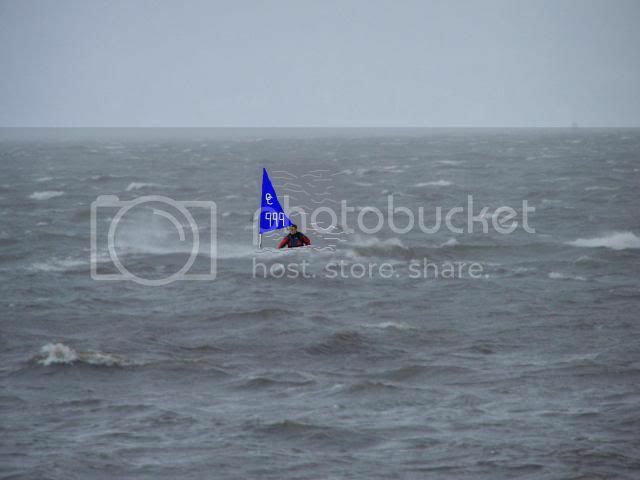 I think your 6sq ft sail will be too small to make progress until the wind and waves are too much to cope with. The other point about a reefed 44sq ft bermudan is that it can be continually adjusted to give you a manageable sail area, and also it is made from proper stable, strong sail cloth. Anything less will not keep its shape in strong winds. or c) a combination of a) & b). As you know my rig reefs down to 20ish sq ft and in conditions that justify using that size I'm starting to get water (not just spray) coming over the side and bow. Granted your canoe has a bit more freeboard and higher ends than mine so may be a little bit drier. The other issue is that even with 20 sq ft up you lose a lot of power and the canoe tends to be "stopped" by each individual wave when sailing upwind. Escape across the wind may be a better option if that'd get you to safety. I also think that in practice dropping your Exped Rig, unstepping the mast, feeding the storm sail over it then restepping the mast would be no quicker or easier (and possibly harder) than reefing an Expedition Rig is. Having said all that if it's only going to cost you twenty quid why not give it a try. If you do decide to try making such a small storm sail I'd be really interested to see how you get on with it though, maybe you'll prove me wrong. Of course you could just sell your rig and buy high spec Expedition Rig instead. Last edited by Jurassic; 20th-December-2011 at 12:46 PM. Reason: editing mistakes out. The "auxiliary power" of a canoe ought to be paddle-power... but I don't have an issue with a storm sail as a means of boosting that power. My testing at Tighnabruaich suggests that ~16 square feet, mounted low and well forward, can substantially aid paddling into (or at least across) even quite strong winds - at least with a canoe that's not swamped. If the same small sail could be arranged to keep us heading at ~45 degrees to the waves when we're swamped to facilitate bailing... so much the better: we'd then have sorted plan B and plan C.
This all needs more work though: we need to get my tiny rig up (reefed) on different canoes in strong winds and do some tests... but the opportunities are not so easy to come by! I suppose could do a little testing with my Jensen 18 up on the broads: will give it some thought. Maybe a slightly bigger storm sail would be a better idea then? A sail of 15-20 sq ft would still be a significant drop down from 35 and the increase in cost would be negligible. I suppose the downside would be that the boom would need to be correspondingly longer and more awkward to stow when not in use. Last edited by Jurassic; 20th-December-2011 at 01:49 PM. Reason: Thought of something else to add. Hmm.... maybe 6 sq/ft is a tad on the small side then, but 20 sq/ft sounds huge to me in strong winds. The total mast length is 7'6 and the Expedition rig boom normally meets the mast 5-feet down from the top, so any storm sail can't really have a height greater than 5-foot. 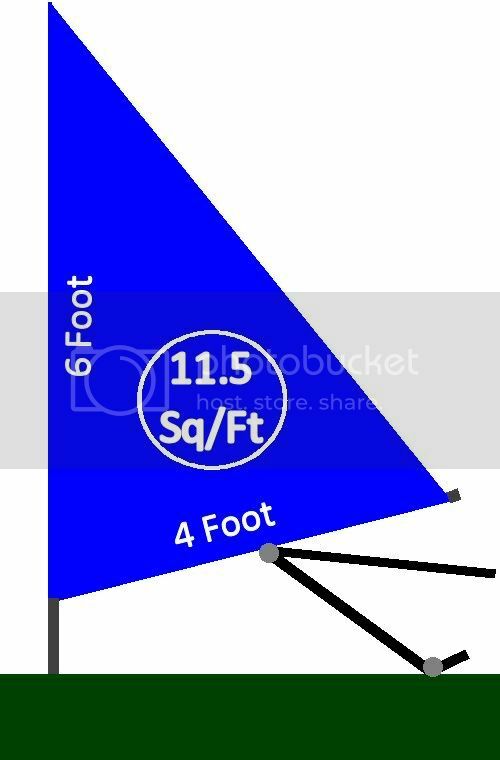 A 3-foot boom would give you a sail area of 7.5 sq/ft, which might still be too small, but a 4-foot boom would give you 10 sq/ft of sail area and I would think that this is plenty if I'm honest. It might be possible to design a boom that could fold when not in use or be telescopic. I've just had an idea, after my hip operation I tried to give my crutches back, but the hospital said they wouldn't take them back (Something about the safety of other patients if they had be damaged - Private hospitals have too much money!!!) 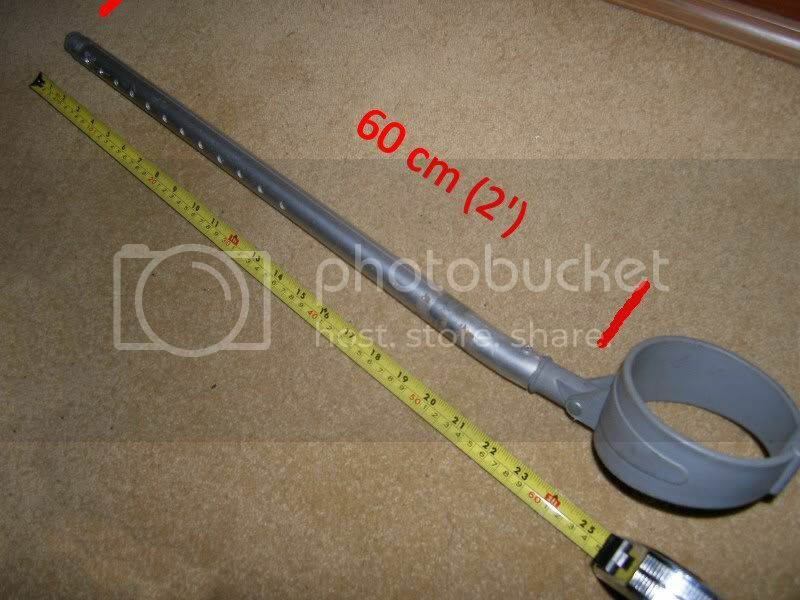 and crutches are telescopic with two spring loaded latches that adjust the length. They could be perfect. I take on board what you say about waves coming in, but picture this, your out at sea, 3-miles from land and the wind starts picking up. At this point you start thinking about reefing down. In a Bermudan, no problem, but most other sail types it's an issue. The Expedtion 35 can be dropped in seconds and thrown on the floor. Our mast is very light and only 7'6 tall. Pulling it out of the mast foot & thwart is quite easy. Then while bobbing up and down, threading a storm sail over the mast with a nice wide 5 or 6 inch pocket, re-step the mast and snaping the boom into position would only take a minute. Thread the sheet through a block on the end of the boom and your ready to go again. As Greg says, cleat off the sheet, centralise the rudder, grab your paddle and head for shore. I also like the idea of having an emergency sail. 5-years ago, my old mainsail ripped (It was 37-years old!) while sailing on Grafham Water. No big deal, I just sailed back on the Jib, but I can't do that if something happens to my canoe sail. Okay we still have a paddle, so it's not the end of the world and perhaps I need to improve my paddling skills, but Expedition rig owners have a short mast, ideally suited to fitting a storm sail. If you are fixed on the idea of using your 7ft 6inch Expedition rig mast as a mast for a bermudan, then i would think about maybe a sprit boom. 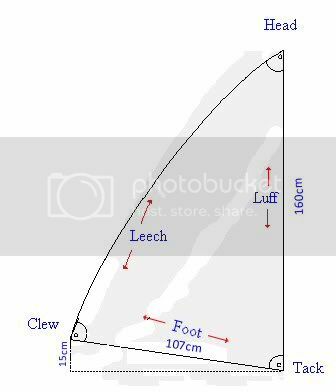 With the luff of the sail going down to the mast thwart and a triangular sail set behind with a sprit boom of 4ft you would get an extra couple of feet so maybe 12 sq ft and the extra luff length will make it more efficient for upwind work. You can set the clew a bit higher so it doesnt bang your head and you don't need the kicker because the sprit does that job. I don't like sprit sails for canoe sails as a rule because they don't reef effectively, but a sail that is meant as a storm sail wont need reefing.I still don't know that this will be a good idea but it may be worth experimenting with. One important thing though is to do it as well as you possibly can and not just an exercise on the cheap. A sail of this size will need to be very efficient to work upwind in a strong wind and a bit if cheap fabric wont do. Yeah you beat me too it there. I was just doing the maths myself and arrived at the same conclusion that getting any sail area bigger than 10sq ft would be difficult on the existing mast. I'm coming round to the idea that the storm sail if used purely as a "last resort, get to safety" tool may be a valid concept. If you're prepared to accept that it would have limited upwind capability in challenging conditions then I guess it could be a viable concept. Even if you couldn't necessarily sail on to your intended destination it may allow you to get to safety. I still feel that if you're caught out in conditions that warrant such a small sail though being overpowered by the rig is going to be the least of your worries. Having been caught out in some strongish winds it wasn't a smaller sail (than 20sq ft) that I was wishing for it was outriggers! Staying upright in those sort of conditions may be possible or even fun if you have the prerequisite paddling skills (like Greg has) but to an average duffer like me or a (self confessed) less experienced paddler such as yourself it could be a dangerous prospect (sorry if that sounds condescending, it isn't meant to be I just can't think how to word it better). That being said I like the idea of the crutch as a boom. It sounds perfect, adjustable, lightweight and designed to take a fair bit of weight. Having a tiny storm sail with you can't do any harm as long as you don't get in over your head by relying on it when it'd be safer not to go out in the first place. Alternatively have a smaller lugsail to raise in place of the Expedition rig. You could have a 15sq ft one easily with only 4ft spars using your existing mast. Look at what I have knocked up spending 10-mins in the garage! Folds from 3'3 down to 2'. Really Chris. 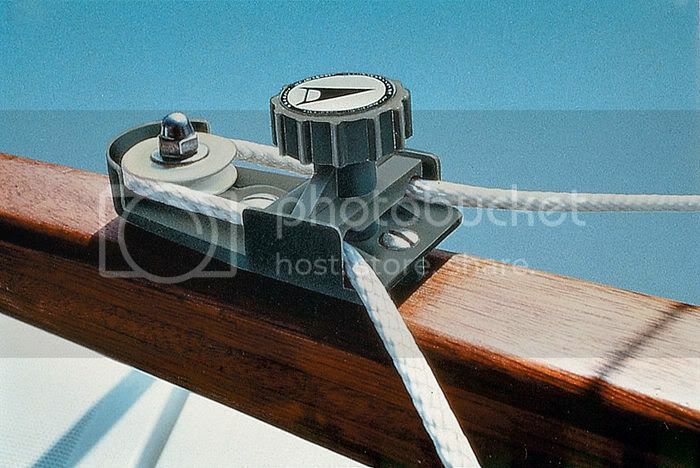 I think if you google image search the word "Tiller", the images that come back will look very similar to mine and the rudder is a Lark rudder, professionally built and up to the job. A storm sail will negate the need to buy stabilisers, um..... I mean outriggers and save me a few quid too!!! Lol . Edit: Forgot to say that this is on my Christmas list, a Tiller Tamer. Decided to go for this to lock my tiller off rather than use a clamp or bungy to hold my tiller in a set position. No point on re-inventing the wheel when I have a conventional tiller. Last edited by Steamerpoint; 20th-December-2011 at 05:12 PM. Okay if I use this boom at 3'3" and use 5'6" of the mast, this would give me just under 9 sq/ft of sail area, which sounds okay to me. Just need to buy some material now and another block and we are ready to sew something together. Funny how all those sailors who go to sea in small skinny sailing boats (Polynesians, canoe sailors in the Hebrides, fisherman in tropical countries and the like) are so stuck on "stabilisers"? Here's a picture of me and the wife on holiday. Last edited by GavinM; 20th-December-2011 at 07:50 PM. Ah ha, it's not like that anymore Chris, I've changed it to this bigger design. What colour material should I go for? Perhaps something bright like orange or yellow? But where's the 5 ft waves? You think? I await the outcome of this with interest and a little trepidation if that's the case. Not all of them are stuck with stabilisers, just those with silly little boats made of sticks. Fireball racing. What a rush!! Now Steamerpoint I do feel I have to ask at this point; do you have your wife's permission for such bravado? Now what would we put our money on? I wonder...............? Sailors who race round the cans for an hour or two with a rescue boat in attendance? Or guys who are out for hours or days at a time, with no rescue boat and often for a living? Beside those aren't skinny boats. What's the worse that can happen Chris, I waste £20, but is'nt it better chatting about trying something new, than doing nothing and dreaming about the better weather next Spring! I need to be nice to her otherwise nothing is gonna get sewn. I can't drive a sewing machine!!! Nope!!! I need to be nice to her otherwise nothing is gonna get sewn. I can't drive a sewing machine!!! OK, this is what we do ....... if you come to the first OCSG meet of the year. I introduce my domestic authority to your domestic authority who is assured we are slightly eccentric but not nutters who would go to sea with little more than a beautiful pea green boat with some honey and plenty of money wrapped up in a five pound note. Meanwhile, you read 'Ocean Crossing Wayfarer', assuming you haven't already read it? Well I'm such a nice guy I upgraded my masterpiece to incorporate the new "Steamerpoint Maxi Storm Sail" and I even went to the lengths of including a sail number as well since it's such a vital addition to any canoe rig! Love the 999 sail number Chris, but should have a marine radio by then. Forget the colour, I'm gonna get hold of a second hand sail from somewhere and cut it to size, so whatever colour it comes in, will be the colour. If I'm going to make something, I'm going to engineer it to work so that it can be relied upon if I need to use it in anger. Storm sails are not new. Sailors have been using them for centuries. They provide some forward velocity enabling some directional control through the rudder, without tipping the boat over or putting unnecessary strain on the mast & hull. The big question though, is how much wind can an open canoe take or more accurately, how big the waves could be before the canoe gets swamped!! I have sailed my canoe in some strong winds now and have matched my downwind speed to the speed of the waves without any drama, but heading into wind was a nightmare! 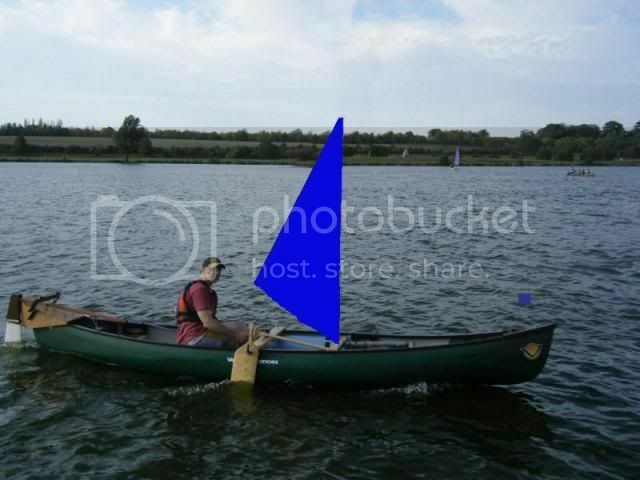 I found that it is possible to beat upwind on a close reach as apposed to close hauled and keep the canoe reletively dry and suggest that this might be my only option in very strong winds. Only problem is the tide then, because I may not be penetrating forward sufficiently. I'm also looking to knock something up that is the difference between going out during a meet, or staying on shore guarding the cars in the carpark. If I have just driven half way across the UK to attend an OCSG meet and when I get there, it is blowing a force 6 or more, with my current setup, I would be tempted to stay behind, but if I had a working storm sail that was likely to keep me dry side up, I would probably go for it. Has anyone been out in force 6+ conditions with a Bermudan rig and remember how small the sail was reefed back to in order that safe progress was being made and outriggers were not needed? Perhaps we could use this as the starting point. perhaps they could pull the sail out to that size again and measure the base & height of the sail to allow us to calculate the area/square footage. 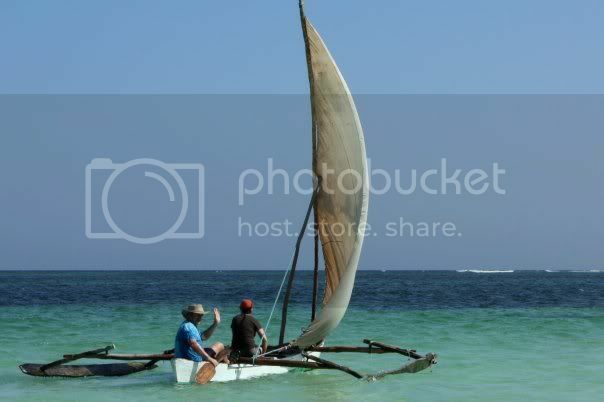 Dave, you tend to sail without outriggers don't you? Any idea's? .....but you really do need to try this with amas before even contemplating without. In the picture above the wind was F6 gusting 7 (independently verified) and I had 4 rolls of sail round the mast (I expect Dave will be able to tell you the sail area). The fetch was about 2 miles and the waves about 4 ft high*. Any less sail and I'd have found it difficult to make speed to windward through the waves. Any more and I would have been overpowered. In these conditions boat speed is your friend and means it is possible to retain steerage, control and to be able to pick a path upwind avoiding the larger waves. 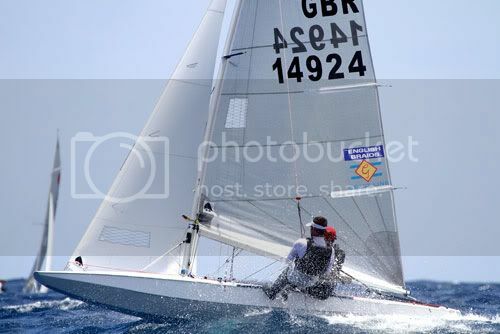 Without amas I would have had to reduce sail and would have been unable to keep the boat speed up and found it very difficult to go upwind with reasonable control. As it was, I deliberately freed off a little and was about 50 degrees to the wind to maintain speed. I was sometimes shipping large amounts of green water over the bow, but was able to keep the boat moving fast enough to keep the self bailer working and the cockpit reasonably clear of water. In an open canoe (unlike my decked canoe above), water in the boat is more of an issue as it has more room to slosh about fore and aft and side to side - which can mean significant loss of stability. Of course, downwind on the way back was easier but when a gust hit and the canoe was riding fast on the bow wave and stern wave, with nothing supporting the bit in between, things became exceedingly twitchy. I doubt I would have been able to run downwind without amas, unless I'd have reduced sail a lot - but if so I'd have been wallowing in the lulls with insufficient steerage and, in any case, I did not want to hang about as it was beginning to get a bit dark by then. *waves nearly always look a hell of a lot smaller in photos, all sailors who have tried to capture the drama of big waves in photos say this. Last edited by GavinM; 20th-December-2011 at 10:46 PM. Gavin probably has between 25 and 30sq ft of sail up in that force 6. Without outriggers i would have about 15sq ft up. I think that this is starting to make a bit of sense now Chris. I have been to several meets this year where it was blowing too strongly for you and your mono hull with a 35sq ft Expedition rig. At Coniston it was blowing a force 5 to 6 on the Saturday and yet everyone managed to get out sailing (albeit just in front of the campsite where we has mutual safety cover.) Most sailors had reefable bermudans reefed quite small or outriggers or both. With your new storm sail you would have been able to go out and have a sail and more importantly be able to try out the sail and find out its capabilities. If you are going to rely on this as a get out of jail card then you will need to know how close to the wind it will sail and how much progress you can make upwind. (you may be sailing pointing at 60degrees to the wind but making so much leeway that you are just sailing back and forwards at ninety degrees to the wind. This is why i think you cannot go too small with this sail. Get photoshop out again and draw the tack of the sail down to the mast thwart. Dave, this is as close as I can draw the sail using the photos I have. This one shows how big it would be compared to the Exped 35. I can go bigger, that's not a problem, but it would limit what I would be comfortable going out in. I need something to potter about in, when everyone is reefing down to handkerchief size sails and 35sq/ft is too much sail, but also as a back-up sail should my Exped 35 break that can stow nicely away. As you say, there is no point going too small if I can't get enough power to push up wind! I'm not sure you realise just how small your sail will be, I still think that your best option would be to go for a reefing rig. 20 sq ft IS a handkerchief size and when I reef down to that size the rig feels tiny. On the Saturday afternoonat Coniston that Dave refers to above I was out with my full rig up (when it was blowing F5-6), your proposed sail will be absolutely minute. This picture that Greg took at Tighnabruaich shows how teeny 20 sq ft is. Like Dave, I'm seeing much more sense now we're talking about options to get out in stronger winds at meets. I'd agree with Chris (Steamerpoint) that his 35 square foot rig, unreefed, could be a limiting factor (especially without outriggers). 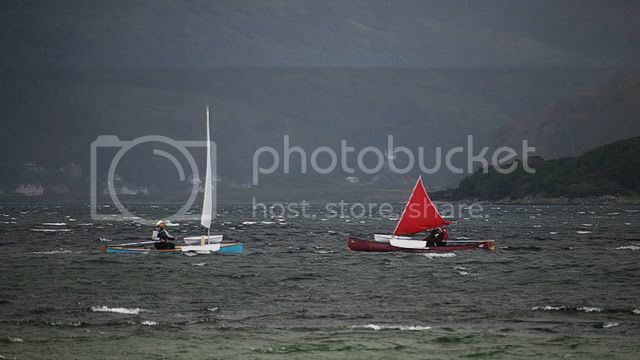 One answer would obviously be to add reefing points to the 35, as per the photo from Tighnabruaich. The other obvious answer would be to compliment the 35 with a sail like mine. My 25 square foot Expedition Rig also reefs... and that's down to nearer 16 square feet. Paddle sailing with that area on my solo in a Force 5-6, that was nice: I was able to go at least as close to the wind as Dave... and made similar progress to Keith and the others. Note: I was looking for assistance from the sail whilst I paddled, and my solo doesn't catch as much wind as most. Filling in the triangle between the boom that you have drawn, the mast and the mast thwart will give you a bit more area where it will do no damage at all. The extra 2ft of luff length will make it more efficient upwind.I dont know how to draw this and post it for you. I agree with Greg though that a reefable 25 Expedition rig would give you all the option. Another point about reefing your 35 down to 20, is that the centre of effort of the sail comes down a lot also. The power of the sail is proportionate to the area, whereas the overturning moment is the area multiplied by the height of centre of effort. The overturning moment will probably be less than half of the unreefed sail. You can see how low Chris's reefed sail looks on the previous picture and also notice that his outriggers are not in the water at all. Is this want you mean Dave? Oh okay.... I see. Lowering the centre of effort, reducing the tilting moment and gaining a few extra square feet without increasing the risk of a capsize. Just harder to look past without a window in the sail, but given a shorter boom, not a major headache! I had considered the idea of a ketch setup, but ruled it out on the basis of needing to fit more mast thwarts & mast feet. It would be easier to buy a Bermudan. I like the 35 though, It's all I need and buying a 25 seems silly when it wouldn't get enough use. We are only talking about using a storm sail once or twice a year, so knocking something up cheaply is all I need. I already have 7'6" of mast to hang something off and a brilliant seamstress living here with all the tools to make me a sail. I just need to calculate the size, which will enable me to move forward 45 or 50 degrees into the wind and I can make something. I guess I can start with something bigger and cut it back if it's too big. Your idea Dave of bringing the sail further down the mast looks more complicated though. I just wanted to run the sail down the mast, extend the boom so the sail is tentioned and run the sheet through a block hanging two thirds along/ at the end of the boom. I wasn't even planning on using a downhaul given that my sheet pulls the boom down towards my cleat on the leeboard thwart. I can get a longer boom to increase the sail area and hang it slightly lower on the mast, but point it up slightly so I can look under it. 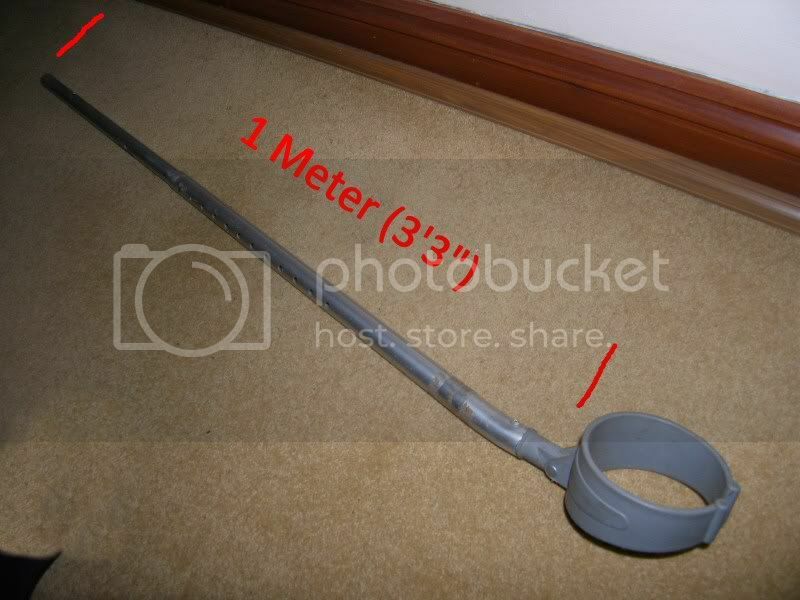 This is a scale version of a 11.5 sqr/ft sail. OK, before this gets really silly. Hands up everybody who has sailed anything in a "Force Eight upwards" - double points if you've "made to weather". I have - and was glad that it was not an unballasted canoe. Force 8 or upwards is not for a canoe, especially an open canoe. No matter how small your sail is. 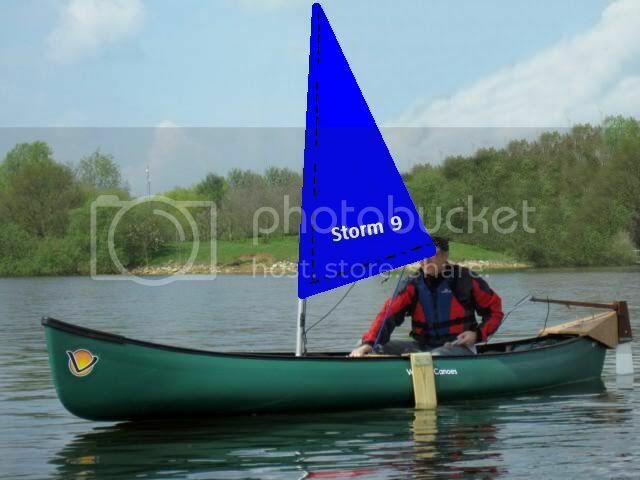 To the best of my knowledge, no member of the OCSG has ever claimed to have sailed a canoe in a Force 8, and I doubt anyone's planning on it either. Unless I've missed something, OCSG experience of being at sea in "Force Eight Upwards" will be limited to yachts and perhaps sea kayaks. Only a very few OCSG members would choose to go coastal canoe sailing in a Force 6 gusting 7... and that's clearly some way short of an F8... but once you start considering a 6 gusting 7 "OK"... being caught out in an 8 will inevitably start to merit discussion. For anyone other than a handful of the most experienced sailers, the OCSG Windscale is perhaps more realistic. A Force Five is presented as a "Canoe-sailors gale for the inexperienced" and as "Too much for most people" and the advice for Force Six remains "forget it!! - unless you are very keen and good". I don't know why we're bothering trying to encourage Steamerpoint to see sense here, he's clearly made up his mind and refuses to listen to those with a wealth of experience and knowledge (or me who has neither ). Steamerpoint, I hope your sail works well and you prove us wrong (but I'm pretty certain it won't work as well as getting a reefing version of your existing rig would). To be honest if you get enjoyment and satisfaction from designing and making it then it's already worthwhile even if it sails poorly. On top of that it keeps us all entertained discussing the subject on here as well. I have a story about being out in a gusting F8ish but I need to go out pre-Christmas visiting now. I'll relate my tall tale of derring do later on if I have time. It is interesting that when Keith wrote the original OCSG Windscale for the old website, some 10 years ago(?) a force 4 was a canoe sailors gale and a force 5 was a forget it. Now we are talking about real sailing on the sea in force6 gusting 7 and now "what if" force 8. There is obviously going to be a real limit on the windspeed that someone in a canoe sized boat can hold up a usable sail area, and i am sure that i have already reached my limit at force 6 to 7. in a decked sailing canoe (without outriggers). 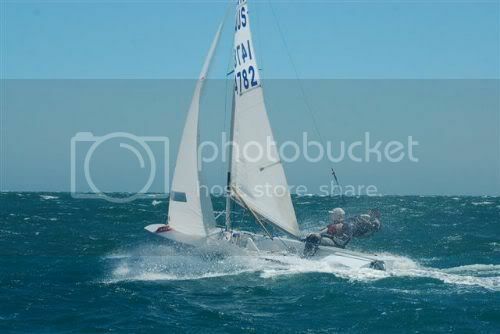 But lets be real here, i was right on the edge of my limit with about 15sq ft of sail up and nearly capsized several times in a 3 mile beat into 3ft waves on Lake Bala a couple of years ago. I wouldnt have managed on that day in a plastic open canoe and if i had capsized i would have been in trouble, even buddied up with Steve and Gavin. Sorry Chris, but I find your remarks a little unfair and unwarranted! Last edited by Steamerpoint; 21st-December-2011 at 09:19 PM. I don't feel it was either unfair or unwarranted however I didn't post it intending to upset you. I was trying to get across that what you propose to do with the storm sail and your reluctance to consider the use of outriggers in extreme circumstances flies in the face of perceived wisdom and the experience of those who have been at this game for a lot longer than either of us. If I have upset you I wholeheartedly apologise for that though, it wasn't my intention. I have been contacted by a commercial sail maker tonight (Through reading this thread), who have asked me to work with them in developing a prototype storm sail and in return have offered to make my sail for free. I have naturally agreed to this as it will save my Mrs a day behind the sewing machine and I will benefit from their skills in making sails. Hopefully something of quality will result. Fingers crossed. I am glad that it was not meant to be hurtful Chris. I am not dismissing anything that has been suggested by you, Dave or anyone else, but my opening post was to develop something new, not give up and buy Outriggers or a reefable Exped 35. If we all simply went out and bought something off the shelf, then nothing new would ever be developed. This is the comment that hurts the most "refuses to listen to those with a wealth of experience ". I am trying to learn what the best size needs to be, not whether I should just give up on the idea and it is that I am trying to listen to. Dave is one of the most experienced canoe sailors on this forum and he has repeatedly stated that he avoids using outriggers when possible and I feel the same, plus they cost nearly as much as a canoe, something I find difficult to justify, I'm sorry. I feel that there is a roll for a storm sail in the same way that storm sails are available on most of the sailing yachts, that also have the ability to reef down their main sails, so the idea is sound. It now seems that a specialist canoe sail manufacturer is interested in this idea too, so perhaps I was onto something after all. The problem with forum's are that it is'nt easy to know when someone is joking/ messing about or being serious, so I will appologise if I got the wrong end of the stick Chris also. I was caught out in winds that were gusting up to 45+mph (which is a lot different to a steady F8) and it wasn't pleasant. There were large breaking waves with the spindrift blowing off the crests. 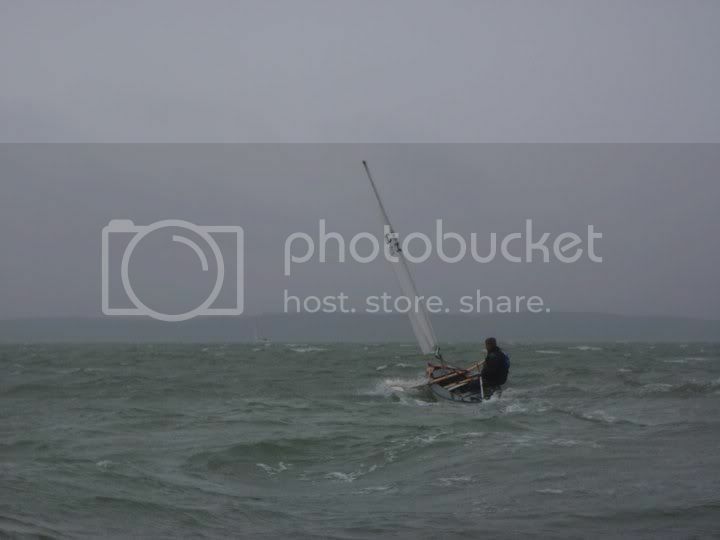 I had my sail reefed and had my outriggers on and I was unable to make headway upwind and was seriously worried about being knocked over while trying to seek shelter across the wind. My first course of action was to head for shelter (which was fortunately close by) then I dropped my rig (mast as well as I didn't want any added windage) and used my double bladed kayak paddle to sneak upwind close to the shore which offered some shelter. I had to kneel at the front of my canoe to have any chance of controlling it and even then it was difficult (made worse by having the outriggers impede my paddle strokes a little). That got me to a point where I was forced to negotiate a headland which would expose me to the full force of the wind and waves. The only way I could manage this was to line the canoe round while I waded (sometimes up to my chest) which was only possible because of the fact that I have quite long painters on bow and stern of my canoe. Lining worked well, I was able to manipulate the painters so that the wind was working in the same way as a current would if you were lining up a river. The only problems were that it was slow and I fell over submerged boulders a few time forcing me to swim a bit. Once round the headland I just had to land and wait for the wind to drop before I could make the final open crossing (which was a bit more sheltered)to my put in. Fortunately the wind dropped off after about forty minutes and I was able to sail the last bit with the full rig up. As I've said the wind was only gusting up to those speeds and the fetch was quite small. I dread to think what it would be like to be out in a "proper" F8, I wouldn't attempt it again. I was accompanied by a friend in a sea kayak and he coped fine (although he found it physically hard work). OK, before this gets really silly. Hands up everybody who has sailed anything in a "Force Eight upwards" - double points if you've "made to weather". I have - and was glad that it was not an unballasted canoe. Not in a sailing canoe but yes, and considering a 'what if' canoe sailing survival scenario is sensible, not silly, and is not at all the same thing as planning on it. Last edited by GavinM; 21st-December-2011 at 11:48 PM. Well I was intending it to be lighthearted teasing incorporating a serious message but you're absolutely right, attempts at humour don't always come across as intended (and clearly that was true in this case so sorry for that). I really enjoy all these crazy discussions we have on here and whilst I don't always agree with other peoples opinions I fully respect their right to hold those opinions (equally I hope they respect my right to hold mine). I find the debates and arguments fascinating (and often very entertaining as well) and I often learn things that I didn't know into the bargain. In this case I don't agree with you but as I said I respect your right to hold your own opinions. I'll go on record and say I don't think that such a small sail will work well enough to justify it's use but I'm quite prepared to be proved wrong (and will be happy to admit it if I am). So to sum up, I wish you the best of luck with your sail, go out and prove wrong but be careful because I think you're underestimating other factors that will challenge you over and above being overpowered by a rig that's too large. I'm off to bed now, early start tomorrow and I'm not used to that after two weeks sitting on my a**e doing nothing. Last edited by Jurassic; 21st-December-2011 at 11:57 PM. Reason: The usual grammatical blunders. I already have the mast and if I knocked up (Got my wifey to do some sewing) a small sail that simply had a pocket down one side to slide down the mast with a small 3 foot boom, (Already sewn in) I could have a 6 sqr foot storm sail should the winds really pick up. It might even be quicker to put up than to reef in the high spec Expedtion 35 and take no space on the canoe. Looking back at the original post, i can see some flaws in the way this thinking process that has unravelled in the following thread. If Chris wants to go and try sailing on the coast crossing large bodies of water then he is right to think about what if the wind picks up. The 35 sq ft Expedition rig was firstly conceived as a larger version of the 25sq ft. Both these sails were designed for the paddler who wants to put up and use a sail "when the conditions are right". They dont have reefs because when the wind gets too strong the sailor drops the sail, stows it away and reverts to being a paddler. The paddler shouldnt use these sails to go out into conditions where they would not be comfortable paddling. When we realised that people were starting to use these rigs as proper sailing canoes we then introduced the Reefable 35sq ft. With this rig if you are sailing comfortably in a force 3 or 4 and the wind picks up, you can reef it down to 20sq ft and comfortably get back to shore. The wind picking up from a force 3 to 4 to a force 4 to 5 is common and should be part of the passage planning that you should be doing as part of safe and sensible sailing. My concern with your solution Chris is that if the storm sail is too small,( and i think 6sq ft definitely is), and in a force 4 to 5 you would not be able to make progress into the waves that this force 5 would kick up. Now with a reefable bermudan rig, a decked sailing canoe is capable of more than this, and as Gavin has said a force 6 is possible for a competent sailor, especially with outriggers. In that case it would be sensible in part of the passage planning to think about what you would do if it blew up to force7 or 8. I am not sure of what the answer to this will be because it is outside our experience in a small boat. Any musings about this problem will probably have to be theoretical and i for one will not be purposefully going out to experiment, but nevertheless theoretical musings are better than trying to make it up on the spur of the moment if it does happen to you. Now Chris's 6sq ft storm sail might be worth thinking about for Gavin, but i dont envisage a force 3 to 4 in which Chris may be sailing in, turning into force 7 or 8. This increase is feasible but i dont think this happens unless it has been forecast and your passage planning should have highlighted this possibility and you should not be on the water. The point about the sailing yachts i think highlights my point. They have reefable sails. They don't go from full working sails in a force 4 to a storm sail, but decrease their sail area in manageable steps that leaves sufficient area for making progress in each of the changing conditions. The other point is that sailing yachts may be expected to survive in a force 8 whereas i don't think this will be feasible in your canoe. We can retrofit the reefing to your sail for a small fee. I know that the high spec wasn't available when you bought your 35, and that you probably were not expecting to fully rig your canoe and set off into the Wash. I don't know who your professional sail maker is but unless he has a lot of experience in sailing open canoes in UK conditions he may not be in tune to the requirements that you have. Sail makers can be very specialised and know a great deal about their particular market but not necessarily have any experience outside it. Really busy at work right now but a quick reply to say thanks Dave. We are now looking at a sail size of 11.5 Sq/ft for all the reasons you have suggested. We have been taking about having a low Cord Offset about half normal (Around 4%) giving the sail a fairly flat shape and allow it to spill air better. Any seems would be parrallel to the Leech for extra strength and the material would be a type able to withstand greater shock for gusts. We are trying to decide what might be better, a sail with an eye in the sail head to hoist it the same way you would hoist the Exped rig using the halyard or my original pocket idea that would slide down the mast. The latter could allow for a damaged halyard and would work as long as the mast was intact, but possibly harder to assemble while on the water. Anyway must dash, speak later. As I have mentioned already, the cord snapped on the top spar of my Exped rig while I was sailing this year. With the absence of another sail (I.e. A Jib Sail) my only option was to drop the sail and paddle back to fix it. No major problem as it was only force 3 and I was only 100 meters from the bank. It does make you think though, what would happen if I was in the middle of the Wash in stronger winds. Having a backup sail does make some sense. Like having a spare tyre or a reserve parachute. Adding reefing points to my Exped 35 would not get around this and I would still be in the middle of the Wash with a damaged sail and a long paddle back. I understand that reefing the Exped 35 is not a quick job and to me, the sail looks to be fairly creased, thus shortening the life of the sail if this is done frequently. Having not seen one up close, I can't really comment, but it reminds me of my reefed Enterprise sail, wrapped around the boom. I do like the neat way a Bermudan is reefed. Very nice, but as a Bermudan Rig is not cheap, not really an option for me anyway, plus I'm not really needing more sail area and the long mast is less friendly than the Expedition rig masts, for which I am a big fan. This all brings me back to having a small, back-up storm sail that is stowed away and hardly used, but could be a real lifesaver in strong winds when it would be impossible to paddle, too windy for my Exped 35 and just need to get back. Furthermore, it could be a bonus going out in a force 6+ with a little storm sail as apposed to guarding the cars while everyone else reefs down their Bermudan's to 15 sq/ft complete with outriggers and goes off for the day. 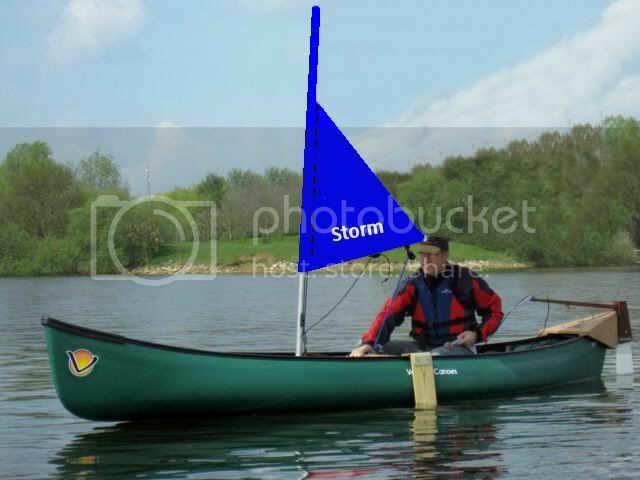 Having a little 11.5 sq/ft storm sail could allow an open canoe without outriggers to venture out for a play, especially if you employ the paddle as a means of extra propulsion. I would imagine that the paddle would be needed in any case to push the bow through a tack, even with 20 sq/ft rig. Another benefit of making a storm sail is cost, plus I already have the mast which I can use. I know that you can retrofit the reefing points in my rig, but as I have said above, I'm not in love with with the way the Exped rig reefs compared to the more superior Bermudan rig. It looks time consuming and I feel that it creases the sail quite badly. I just want to try this sail idea. I might be the only person that sees any benefit and the only person to get one, but it might turn out to be very good and other people might decide to make/ buy one. Would your sailmaker be Mick of Flat Earth, who has been asking about producing sails for open canoes? Just curious, as I am interested that much of our experience on this forum seems to be in canoes, but it seems to me the kayak sailors may indeed have something to add in terms of experience of sea sailing in strong conditions and also in terms of sailing with smaller sail areas in narrower boats. I've been very much enjoying reading everyone's views (thank you, all), and have added nothing, as I've no real experience to add. I remain curious though in the trade off between width of boat and size of sail. Greg seems to have ultimately opted for a 25' sail for his narrow Flashfire (26" at the waterline, Greg? ), reefable down to something like 16'. All this interests me because as well as having a narrow-ish canoe at about 31", I think, I've a couple of folding kayaks at about 26" width and wouldn't mind trying sailing with them. I did indeed try one with the SD Expedition sail, but after capsizing it in very light airs decided 35 sq ft was probably a bit much for it. (Though I should add there was an element of operator error involved there too .) I ought perhaps to try borrowing a 25 sq ft expedition sail sometime though to see how it goes with that. Anyway, as I say, interesting debate. Thanks all. People have tried all sorts of things in survival sailing situations - some have lived, and some have died. At this time of year - if you want to start thinking about some of the possibilities - then some reading is in order. 1 - "Heavy Weather Sailing" Edited and Published by Adlard Coles - This is the "must read" book - His points on the dangers of running off downwind and the difficulty of judging conditions outside your normal range of experience on their own are worth the purchase price. The forum highlights many scenarios for dealing with heavy weather survival. Thanks for pointing that out. All the boats on there are bigger than sailing canoes and many have mizzens. Many years ago i favoured cruising with a mizzen as it easy to sit the canoe head to wind by sheeting in the mizzen. At the time i was sailing with a balanced lugsail ketch and sitting comfortably head to wind whilst i dropped and reefed the main was a good idea. It took several minutes to tie in a tidy reef and the mizzen really did look after you. I have since been sailing with a bermudan rig, and the speed at which this sail reefs means that it can be done in seconds (one handed) whilst still sailing forward, so that the canoe remains under control. The sail still performs when it is reefed down to a quarter of its size and will still sail upwind under control in a force 6. One theoretical problem is the remaining mast above the furled sail, being just drag, and particularly as it is stuck up high where the wind is strongest. From the point of view of drag this has got to be a bad thing and something that we would be better without, but so far this doesnt seem to have been a major problem. As the wind increases it is possible to furl even more sail away, and then the balance of drag from the mast. the boat and you will eventually overcome the drive from the pocket hankerchief sail and then what? The long mast of the bermudan does have some advantages. It increases the roll momentum of the canoe (and a canoe has a very small roll momentum). If you are hit with a wave on the beam the canoe can tip very quickly and you need to react very quickly with moving your weight into the wave to prevent a capsize. This is very tiring and needs a lot of skill to keep it up. With a long mast up the roll momentum goes up greatly and the speed at which the canoe tips is much slower. You still need to move your bodyweight to hold the canoe upright but it happens more slowly and so is less tiring. That said eventually the windage of the mast alone may be enough to capsize you. Having a mizzen on, even a small one, may be worthwhile to help keep the canoe facing into the wind. Facing into the wind and waves should make for less tiring balancing of the canoe. The problem with the mizzen is that with the bermudan main, the main should be set further forward to keep the rig in balance. The quick reefing of the bermudan relies on you being adjacent to the mast to furl the rig and set the kicker, outhaul and down haul. If you move the main too far forward you cannot easily reach these lines and the mast and you then need to make these workable remotely. We have done this in the past but it is complicated and not totally reliable. Moving forward to the bow to sort this out in a blow and waves would be a nightmare. On the plus side, if you could take down the main and stow it safely on the deck you could have a middle mast position in which to set up the mizzen. Without the extra windage of the main mast you may be able to continue sailing in stronger winds, but taking the main up and down on the water is not easy, especially in big waves and strong winds. I noticed on the forum that someone has successfully used his main rig as a sea anchor as a last resort, in a larger open boat than a canoe, so perhaps this is something for me to try the next time i am on Coniston in a force 6. With a canoe the weight of the rig and the forces involved are much less than a bigger open boat, so retrieving the rig should not be too much of a problem. Would your sailmaker be Mick of Flat Earth, who has been asking about producing sails for open canoes? Just curious, as I am interested that much of our experience on this forum seems to be in canoes, but it seems to me the kayak sailors may indeed have something to add in terms of experience of sea sailing in strong conditions and also in terms of sailing with smaller sail areas in narrower boats. I've been very much enjoying reading everyone's views (thank you, all), and have added nothing, as I've no real experience to add. Anyway, as I say, interesting debate. Thanks all. Hi Ian, you guessed it in one. 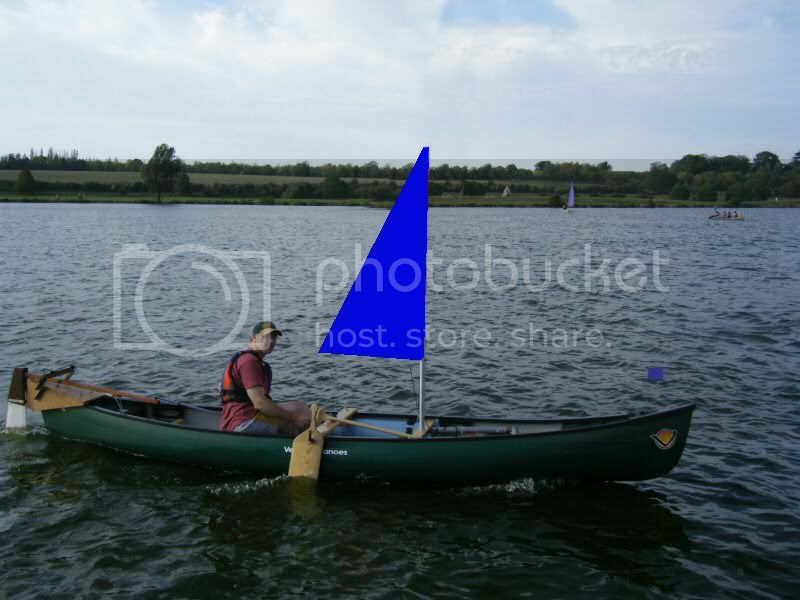 Mick has a lot of experience in canoe/ kayak sails. He has already contributed a lot to the design of my storm sail idea. Below is the latest design. We can't lower the sail any further than 5'5" as the boom claw would foul on the halyard cleat on the mast and the boom can't be any longer than 3'6" else it will hit the helm during a tack, so that's it, a maximum sail area of 11 sqr/ft, but I feel it should be enough. The centre of effort should be nice and low reducing the risk of a capsize. We may need some battons though, but this will make it harder to stow, but not a deal breaker. Last edited by Steamerpoint; 22nd-December-2011 at 08:33 PM. Have you ever met a storm trysail?